Recently in America, nothing has been argued about more, or more vociferously, than child-rearing methods. As though such a thing existed. One might as well talk about wolf-watching methods. They do it to you, you don't do it to them. You may have heard, for instance, of the self-proclaimed "Tiger Mom" - that Asian mother who boasted of pushing her kids brutally through school and towards success - though surely the memoir of the Tiger Cub will be the one to read. The real truth about teenage or adolescent kids is simple though, and I will announce it here. The one thing that is written into the human genome is that exactly at the age of 13, your child - in a minute - and no matter how close or sympathetic the two of you have been before, will discover that you are now the most embarrassing, ridiculous and annoying person on the planet. This is a universal truth. It will sometimes be expressed in a tone of pitying condescension, and sometimes in one of exasperated wrath; you can tell depending on whether the modifier or the noun is stressed: "Dad, you are so weird," is almost affectionate, while "Dad, you are so weird," is close to hostile. 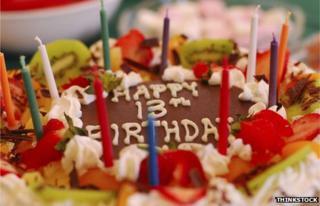 The 13th birthday arrives, and the genome lights up like a Christmas tree when the mayor throws the switch. The parent who only a few years - a few months before - was a fount of wisdom and expertise and even companionship, becomes those three things: ridiculous, embarrassing and annoying. The three fall in a neat exact order, and a highly specific sequence. You are first of all ridiculous because of your pretensions to be cool. You persist in the belief that you know good pop music from bad, or something about the relations of teenage boys and girls. And this in spite of the obvious truth that you are barely sentient, with one foot rooted in the dim, ancient past while with the other your toes are already tickling eternity. You are embarrassing because, in spite of being ridiculous, you are not content to keep your absurdity decently to yourself, but insist on parading it around in public, greeting the 13-year-old's friends and teachers as though you were a normal human being and not a kind of ward of the state, on the brink of being permanently committed. Image caption "Dad, could I have the controls back please?" It is bad enough to be ridiculous, but do you also have to be so public about it? And you are annoying, because, in spite of being ridiculous, and in the face of the wild public embarrassment you obviously cause, you still actually think that you can give advice and counsel - strongly suggest, or even command the 13-plus-year-old to do things. No parent can hope to eliminate all three, but what every parent is capable of doing - and all that any parent is capable of doing - is to eliminate exactly one of the three as an accurate descriptor. "I may be ridiculous and annoying", you can say, honestly, "but I am not embarrassing". Or, "I know I embarrass you, but you cannot accurately call me ridiculous." One out of three is the game of life. What I might call my special insight into this truth is that I have discovered, I believe, that this one-in three rule is generational - that is, each descending generation can, and on the whole does, eliminate one of these three. At least in the kind of modern urban family where the first generation came to the new country, or rose from the mines and working classes (in my case, both); while the next became educated middle-class people and then the next, my own, became worried, harried professionals, hovering over one or two hyper-favoured kids. Your grandparents, for instance, were, to your parents, wildly embarrassing and hugely annoying but they were never really ridiculous. Their lives ran consistently together from one end to the other. Even when they were young Jewish people they were, so to speak, old Jewish people. As, in another context, even when our grandparents were old working class people they resembled what they had been like as young working class people. Their beliefs and rituals and ways of life ran true, they were creatures of habit, but not of fashion; and we always grant to habit the near holy aura of ritual. Image caption Do Jean-Francois Millet's peasants achieve more dignity than modern parents? It's the same reason that Millet's peasants, in his paintings, seem so dignified to us; if they changed their smocks and chapeaux every season they would be merely pathetic, but there, in the same costumes, they submit to the centuries and can hold their heads up, or rather bow them down, but you get the point. Our grandparents, similarly, were always themselves, and made no attempt to become some other self-seen in a glossy magazine. They accepted the immutability of identity. Our parents in turn, though they often struck us as annoying beyond belief and ridiculous beyond measure, could not accurately be called embarrassing. Theirs was a middle generation of aspiration; first to education, which they achieved, and then to sophistication, which they thought that they had achieved. They were ridiculous because they were so constantly in flux: they changed their hairstyles and their clothes - look at those old photos. Ridiculously hirsute in the 60s and then absurdly wide-lapelled in the 70s. But you could not call them embarrassing - they were interesting people. They had had interesting lives, they were broadly cultured, they knew which way was up whether they were looking at a Brancusi sculpture or a six-inch spliff. You might not want to share a spliff with them - but they were not embarrassing in front of your friends. They had the avidity of the ambitious. Our generation - the third generation - are, as our kids assure us, by far the most ridiculous and the most embarrassing generation that has ever lived. We are ridiculous because, where our parents liked to share stories of their cooler youth with us, we actually think that our super-cool youth is still going on. We have no idea of how out of it we are, and yet persist in acting as though we're with it. We don't have the decency to withdraw back into our own generation, we advance into theirs. This is ridiculous beyond words; embarrassing beyond measure - and yet we are not, really, annoying. When our kids want something, we try to oblige, within reason. They play us the dirge-like music of Radiohead, or the glee club chanting of Arcade Fire, and we listen for hours, piously. They insist on texting us rather than actually making a phone call, and we obligingly learn to text ourselves. A couple of summers ago, my own now 17-year-old son, knowing that we were going to London on a summer visit, came into my office and asked, very sweetly, if it might be possible to go a few days early so that he could attend the Blur reunion concert in Hyde Park. Not only did I assent at once, but I actually insisted on going with him, wearing madras shorts and an old shirt and ducking beer bottles. You can hear me on the live recording, singing along with to "Tender". "C'mon, C'mon, C'mon". Really you can; I don't know why he finds it ridiculous when I insist on this. I know what you are asking: what can come next? Once the cycle is exhausted generationally, what follows? I was puzzled by this too, until, sharing these thoughts with my son, he said, evenly and without a trace of rancour, "You know, it's your not being annoying that's the most annoying thing about you. You're sort of meta-annoying." The cycle, I saw, will not begin again. It will simply advance, like modern art, into new areas of self-conscious annoyance, more ironic ridiculousness, more self-aware embarrassment. The truth about kids therefore, whatever Phillip Larkin may have said, is to stay in as long as you can; and have as many kids as possible. That way, there is bound to be a child, somewhere in the unfolding generations, who, dismayed by this meta-madness, will look back on you as the embodiment of simple unaffected life, of the unridiculous, of peasant like poise combined with sage like reticence. "That's your dad?" they will say, looking at your old iPhone photo among all the holograms. "He's so… period." "Trust me. He was ridiculous," your own child, now an aging great-grandparent himself, will say. "I don't know. He looks... kinda cool. Was he annoying?" "No," your now aged child will admit, "He took me to this Blur concert, once". "You were lucky," the kid will say. And your child, through his grey beard, will nod - reluctantly, perhaps, but he will nod. He'll have to, because it's true. Life is made tolerable by such small-imagined mercies.